Fred McMurray was born in 1945 in Hasting, Nebraska. After earning his bachelor's degree from the University of Idaho in 1967, he entered Officer Training School on October 2, 1967, and was commissioned a 2d Lt in the U.S. Air Force on December 22, 1967. Lt McMurray first attended Undergraduate Pilot Training at Williams AFB, Arizona, from February to June 1968, and then completed Undergraduate Navigator Training and was awarded his navigator wings at Mather AFB, California, in May 1969. After completing F-4 Phantom II Combat Crew Training, he served with the 336th Tactical Fighter Squadron at Seymour Johnson AFB, North Carolina, and then deployed to Ubon Royal Thai AFB, Thailand, from March 1970 until he was forced to eject over North Vietnam and was taken as a Prisoner of War on September 12, 1972. After spending 199 days in captivity, Capt McMurray was released during Operation Homecoming on March 29, 1973. He was briefly hospitalized to recover from his injuries at Travis AFB, California, and then attended Undergraduate Pilot Training, earning his pilot wings at Williams AFB in October 1974. He then completed F-111 Aardvark Combat Crew Training, followed by service as an F-111 pilot with the 524th Tactical Fighter Squadron of the 27th Tactical Fighter Wing at Cannon AFB, New Mexico, from November 1974 to September 1979. During this time, he attended Squadron Officer School at Maxwell AFB, Alabama, graduating in April 1975. Maj McMurray's next assignment was as an F-111 pilot with the 493rd Tactical Fighter Squadron and as Chief of Wing Weapons and Tactics with the 48th Tactical Fighter Wing at RAF Lakenheath, England, from October 1979 to June 1982, and then on the staff of Headquarters U.S. Air Forces in Europe at Ramstein AB, West Germany, from June 1982 to October 1983. 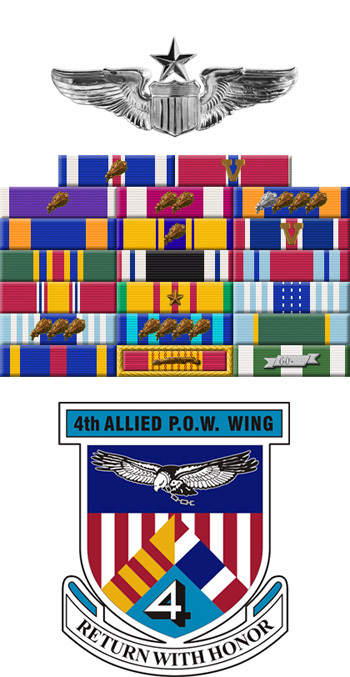 He served as Assistant Deputy Chief of Staff for Operations and Plans with Headquarters 16th Air Force at Torrejon AB, Spain, from October 1983 to October 1985. Col McMurray's final assignment was at RAF Lakenheath, England, where he served as Chief of the Capability Assessment Team and then as Operations Officer for the 495th Tactical Fighter Squadron at RAF Lakenheath from October 1985 to October 1987, and then as Chief of Wing Plans for the 48th Tactical Fighter Wing from October 1987 until his retirement from the Air Force on September 1, 1988. 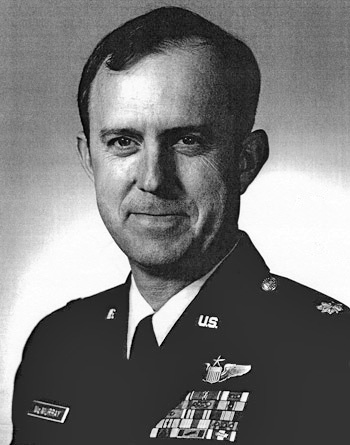 Captain Frederick C. McMurray distinguished himself by extraordinary achievement while participating in aerial flight as an F-4 Phantom Weapons Systems Officer over North Vietnam on 16 August 1972. On that date, Captain McMurray was assigned to fly as a wingman in a force of eight F-4E Phantom Aircraft on a chaff dispensing mission over Hanoi, North Vietnam. With complete disregard for his own personal safety he skillfully maneuvered his aircraft to evade a barrage of surface-to-air missiles, yet maintained the proper formation to lay the desired chaff corridor. The success of this mission greatly reduced the radar capability of the hostile defenses and made it possible for the bomber force to strike a strategically located railroad and highway bridge. The professional competence, aerial skill and devotion to duty displayed by Captain McMurray reflect great credit upon himself and the United States Air Force.